Here is a list of Filipino festivals, fiestas and local celebrations in the month of January 2014. January 1 | Annual procession, parade of flowers and costumes. January 3 | A feast honoring the Three Kings who are visiting the houses around the Poblacion of Gasan. January 3- January 16 | Scene of a yearly celebration in honor of Sto. Nino held every third week of January, popularly known worldwide as Ati-Atihan. So called because Aklanons, domestic and foreign tourists, wipe soot on their faces and done ethnic paraphernalia and masquerade around town as Negritos and make merry and dance in the streets to the beat of ambulant ethnic troubadours. January 3-16 | A weeklong celebration highlighted by a Mardi Gras with participants’ costumes made of coconut-derived materials. January 5 | The town’s celebration of Charter Day and a befitting culmination of the Christmas season, the festival is conceptualized as a festival of hope and thanksgiving. Thanksgiving for all the blessings received in the year that was and hope for a prosperous new year. Its unique feature is the use of lights or “luces” as props and adornment and its nocturnal festivities and streetdancing. January 7 | Fluvial parade at the sea to Calumpang River and merrymaking at the capital town. January 9 | Commemoration of the liberation of Lingayen from the Japanese forces by Gen. Douglas Mc Arthur of the US Pacific Command. January 9 | An intense, day-long festival highlighted by a mammoth procession through the streets. January 9 | Fluvial parade at the sea, merrymaking and street dancing contest at the capital town. The feast honors the Sto. Niño. January 10 | Translated literally, it means "Day of Koronadal" and indeed it is. Hinugyaw Festival, dubbed as the "Festival of Festivals", is a celebration of the different cultures that has dwelled on the fertile valley of Koronadal for many years now. January 10- January 16 | Binanog is a yearly festivities celebrated by the Lambunaonos every January in honor of infant Jesus. Binanog means a pool of dance by the people in hinterland of Lambunao. The following are the Binanugan, the dance depicting the movement of the birds, the Inagong sayaw-sayaw, a celebration dances and the Dinagmay, the courtship dance. The dance movement is accompanied by lively drum beatings. January 10- January 16 | Revelers garbed in distinctively colorful costumes with bare bodies painted in black soot take to the streets to the riotous and frenzied beats of drums celebrating the feast of El Señor Sto. Niño. January 3rd Week | Carabaos are dressed and paraded around the barangay; Dancing and Singing events are likewise held. January 15 | Celebrated every 3rd Sunday of January, is Cebu''s biggest and most popular festival. The feast is in honor of the Holy Image of Senyor Santo Niño de Cebu. Fiesta Senyor, as it is widely known, is the most celebrated among Cebu''s festival where people converge along the routes of a grand solemn procession and partake in the gaiety amidst a mardi gras parade immersed in wild colors and the constant beating of drums. January 15 | The ati-atihan festival of Makato dates back before the Spaniards came to sow the seeds of Christianity into this land. During the celebration, thousands of Catholic devotees from all over the country and those from abroad felt the urge to come and join in the wholesome, frolic and religious fervor of thanksgiving to the Holy Child, Sto. Niño. January 15 | Celebrated every 3rd Saturday of January. This spectacular & exciting event find its origin on a hillside in one of the inland barangays of the municipality when resting farmers witness for the first time the fight between the two raging bulls, set loose by their herdsmen. It caught the fancy of the barangay folks and soon it became a popular entertainment in most barangay fiestas. During the municipal fiesta, the best bulls from different barangays are pitted against each other by weight category in a “Bull Derby”. 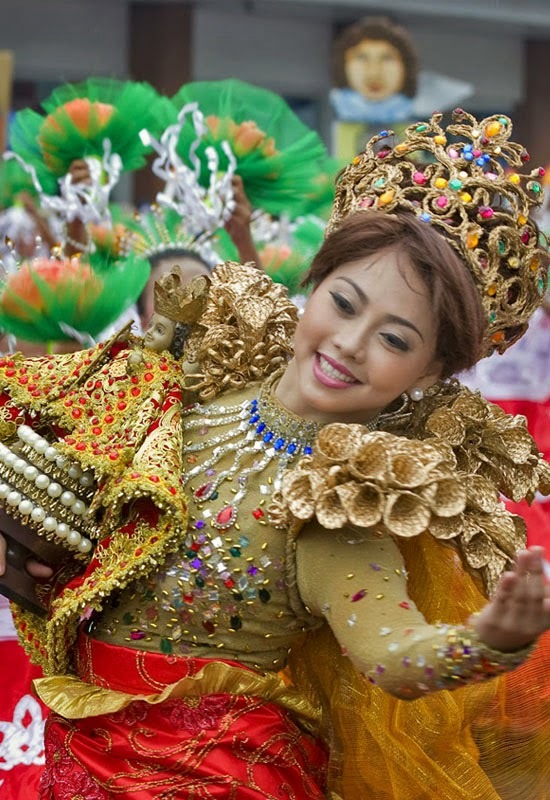 January 15 | Butuan''s version of the Sinulog of Cebu which has an equally lively and spectacular street dancing. January 15 | One of the highlights of the Navotas Day celebration featuring a street dancing and float competition focusing on the fishing industry. January 15 | This cultural festival makes maximum use of the rich cultural tradition of the oldest municipality of the province. The presentation of songs, dances and musical tableau depicts the various influences Buenavista has been subjected to. Celebrated in honor of the town’s patron saint, Sr. Sto. Niño, Kinaradto promises the participant loads of unforgettable positive experiences. January 15 | The participants celebrating this festival wear masks made up of paper mache and prepared costumes. The festival is celebrated in honor of the Sto. Niño with merry making for a bountiful harvest, peace and prosperity, street dancing along the streets and plaza of the poblacion. A holy mass is celebrated before the start of the contest on Sunday morning proceeded with a parade of participating tribes. January 15 | Highlights of this District Fiesta of Arevalo are the multicolor fireworks. The skyline becomes a celebration with the dazzling display of sparkles and blazing lights. January 16 – 18 | A celebration highlighted by street dancing competition with participants’ costumes made of bamboo grass materials. January 17-19 | A thanksgiving for a bountiful harvest which coincides with town fiesta. It features dances and cultural presentations by schools and barangay communities. January 17,18,24 & 25 | A religious festival honoring the Sto. Niño or Jesus, the Holy Child. This is characterized by street dancing, Mardi Gras with participants pouring water among each other, recreating perhaps, the baptismal rites of the old. January 18 | Held every 18th of January, the Bayanihan Foundation Parade is a street fest displaying the bayanihan or Filipino command spirit of cooperation which makes seemingly in possible feasts realization. The event highlights the four evolution of the town from aquatic, agriculture, professional and to a industrial progressive city. January 18 | The event showcases the rich cultural heritage of the indigenous people, specifically that of the Mangyan people, through activities such as street dancing, exhibits and cultural shows. The main concept is to promote and celebrate the “Dugoy Spirit” of camaraderie among the people of different culture and the harmonious relationships of the Sablayeños. January 19 | “Sadsad Sa Kalye” is a dynamic mass presentation expressing the beliefs, views, visions and aspirations of the Janiuaynons based upon tradition, historical experiences, and culture of the people of Janiuay. It is a street-dancing affair buoyed by the kaleidoscopic prism of cultured grace and fineness that reflects the embodiment of all that are beautiful in man’s body and soul. “Sadsad” is a native word meaning dance. January 19 | A celebration in honor of its patron saint, Señor Sto. Niño characterized by street dancing and other religious and cultural events. January 19 & 26 | A procession held at the Lumban River, where the icon of the patron saint San Sebastian together with hundreds of devotees is afloat on “Kaskitos”, or bunch of big boats. January 20 | A cultural and fiesta celebration. January 20- January 22 | A spectacular street merrymaking in honor of the Holy Child Jesus. January 21- January 22 | This day marked the end of the Fil-American war in Altavas. Since then, January 22 is being celebrated as an Annual Thanksgiving and Armistice Day in Altavas. Later, the date was adopted as its municipal town fiesta. This is the continuation of the joyous celebration of peace when Fil-American war ended in this municipality. January 23-24 | The town fiesta in honor of San Ildefonso de Toledo is held every January 23rd . Musical band sponsored by the nine barangays roam around the town. The musical exhibition and competition is held in the afternoon of January 24. Painting exhibition, carnival and amateur singing competitions are likewise held. January 23 - February 2 | Held in the town of Paracale, highlighted by “pabirik” street dancing depicting the gold mining industry in the province. It coincides with the 400th year Foundation Anniversary of Our Lady of Candelaria, the town’s Patron Saint. January 24 | These features cultural shows and traditional fiesta activities like procession, traditional games and cultural presentation. January 24- January 25 | A religious feast in honor of its patron saint Sto. Niño, held by transferring the holy image of the patron from Ibajay Cathedral Rectory and enthronement at St. Peter Parish Church, by way of amusing the image from where it was originally discovered and brought to the church. January 24- January 30 | A revelry from sunrise to sunset, with ceaseless and rhythmic beating of drums. A sea of humanity in cadence with black soot “ati” performing rituals, all in honor of El Señor Sto. Niño. A spectacular fluvial parade where the Infant Jesus is carried aboard a fishing boat around the river, out to sea and back. “Dinagsa” connotes the sudden surge of good things washed ashore, such as the generous catch of fish and other sea foods, which Cadiz is famous for. Throw all cares to the wind as you street dance with gaily-costumed ati-tribes. Be game however if you find your own face painted black by playful ATIS. January 27 - February 3 | Activities include: mass at the St. Paul Cathedral, procession around the city, “Talent Night ti Saniata” where local songs will be aired, beauty contest, “Partuat ken Patanor Trade Fair,” concerts, Delphic Games, horse race, Quiz bee, on-the-spot painting, Iloco poem writing, Kannawidan a pay-ayam-Sarsuela Ilocana, Bingo Game and Battle of the Bands. January 28 | Primarily a celebration of the economic endeavor that made Jordan what it is today. Sana-aw also pays tribute to the skillful artisans and the enduring workers in an endearing characterization through dance drama. January 30 | The Malolos Sto. Niño featuring a week long exhibits, a month procession featuring more than a hundred caros of drivers Sto. Niño images. January 30- February 6 | An annual festivity of Calinog’s devotion to Sr. Sto. Niño. It is a nine day event and its activities consist of an opening salvo, food fest, live Sto. Niño contest among young boys not older than seven years old, Search for Lin-ay Kang Hinirugyaw and the contest proper for all participating tribes in three judging areas. January 31 to February 2 | A three-day celebration from January 31 to February 2, to reflect the devotion of the people of Candelaria in “Nuestra Senora de Candelaria” likewise known as the Candlemas Virgin. It shows insights on the magnificence of the culture and tradition in the locality. The candle float parade and street dancing competition are among the major activities of the festival. January 31- February 5 | The country’s biggest windsurfing event drawing participants from all over Asia. If would be better if you can send photos, but not necessary.